Load SecuringSecuring your load correctly and efficiently is very important. It will help to protect cargo, vehicle and people. 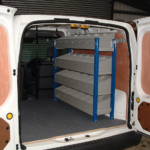 Our van load securing rail and matching accessories will just do that and more! Matrix SetsMatrix is a truly an ingenious system: work is suddenly simpler and less strenuous. The outfitted vehicle becomes one big workshop, with everything within easy reach. Just choose the Sett that suits you or create your own using the various Modules available. Matrix ModulesMatrix is a highly versatile system: today, indeed, any commercial vehicle on the market can be fitted with the Matrix system. The modular system designed and built in Italy allow personalised fitting out, with rational use of available space ensuring the optimum solution for every possible combination. Along with safety guaranteed by USAG part of the STANLEY Group. Matrix gives added certainty when travelling to any job: an ingenious mobile workshop that puts everything in order for you. Garage & Workshop SolutionsWe have a wide range of garage shelving, industrial shelving as well as storage boxes and small parts bins. 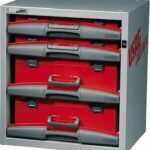 Storage BoxesWe have a wide range of products to catter all type of storage requirement. From cardboard bins, small parts bins, transparent tilt bins to plastic drawers and large plastic boxes. All our boxes are made in the UK or Italy to tight tolerances, with the best materials. Our Euro range are food safe plastic boxes. Ideal to use with Vega van shelving. Two modules 495mm wide can be fitted on a 400mm x 1000mm Vega shelf to create the perfect van storage solution to suit your needs. If not in stock, standard delivery time is 1 to 3 weeks.